Winter weather is upon us! While some people embrace the cold, others (myself included) would much rather stay indoors under a pile of blankets. Cold, gray days can also trigger seasonal affective disorder or intensify depressive symptoms. Although I continually struggle with fighting the physical and emotional chills that come with this weather, I’ve found that a nice, hot beverage is a powerful way to soothe and defrost myself. 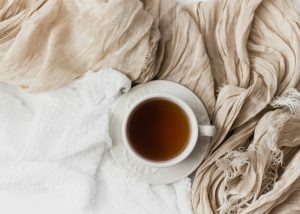 There are few things I find more comforting than curling up with a hot beverage on a cold day. There’s something so soothing about holding a warm mug and sipping a delicious hot drink – it’s a great way to unwind after a long day! It’s also a good way to practice mindfulness. It’s very difficult to chug a hot drink all at once: it requires you to slow down and take some time in between sips. This allows you to enjoy the drink (and its comforts) for a longer time. I find that a hot drink is the most satisfying when I’m feeling physically cold. Holding the cup is an easy way to warm my hands (which are often the coldest part of my body! ), and that warmth spreads to my mind and body as I drink. There is evidence that hot beverages can “warm” you up in other ways as well. 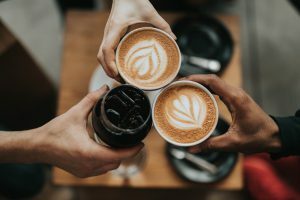 One research study found that participants who held a cup of hot coffee as they were introduced to someone made a more positive impression to the other person than those who held iced coffee. Things implying warmth tend to make us more receptive to others, while our brains may associate cold sensations with isolation. Another research study found that people who experience loneliness or social isolation may literally feel colder than those who don’t feel lonely. Our brains may also connect warmth with the feeling of a welcoming hug, which could explain why we feel more social when we are warm. So the next time that you’re feeling a little cold, whether internally or externally, try sipping a hot drink! There are so many to choose from, such as coffee, hot chocolate, hot cider, and many varieties of tea. You can also add different flavors like mint or cinnamon to create the perfect beverage! Personally, I am partial to mochas because coffee and chocolate are my two favorite flavors 😊 I also love to make my own hot cocoa by steeping cocoa grounds in boiling water, and then adding milk and sugar. It has such a rich chocolate taste, and it has energy-boosting properties with less caffeine than decaf coffee! Have a warm and cozy winter! Do you enjoy hot drinks? Do you think warmer drinks have an effect on your mood and how you’re feeling? What are your favorite kinds?